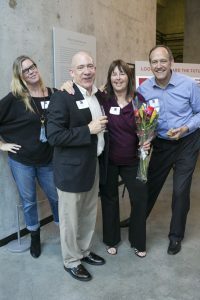 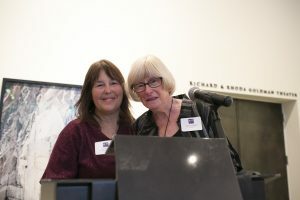 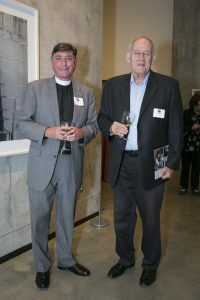 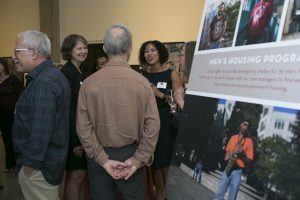 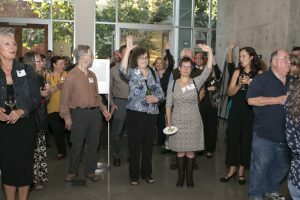 On the evening of October 1st, more than 145 guests gathered in the spacious ground floor of the David Brower Center on Allston Way to pay tribute to Berkeley Food & Housing Project (BFHP) on the occasion of its 45th anniversary. 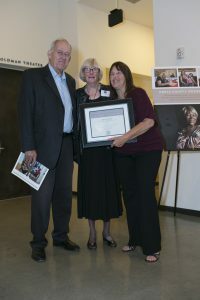 The group included community leaders like Vice-Mayor Linda Maio, Council Members Susan Wengraf, Jesse Arreguin, Kris Worthington, and many others who — along with BFHP board, staff, donors and friends — came to celebrate long-time Berkeley resident and activist Dorothy Walker, who was being honored that evening for her work on behalf of the agency. 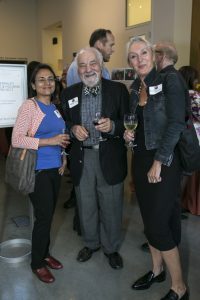 As guests mingled and enjoyed hors d’oeuvres and wine provided by ACT Catering and Cassave Taqueria, they had a chance to learn about the work of the agency from the many large story boards positioned around the lobby featuring color photographs by noted local Berkeley photographer Jessica Eve Rattner.